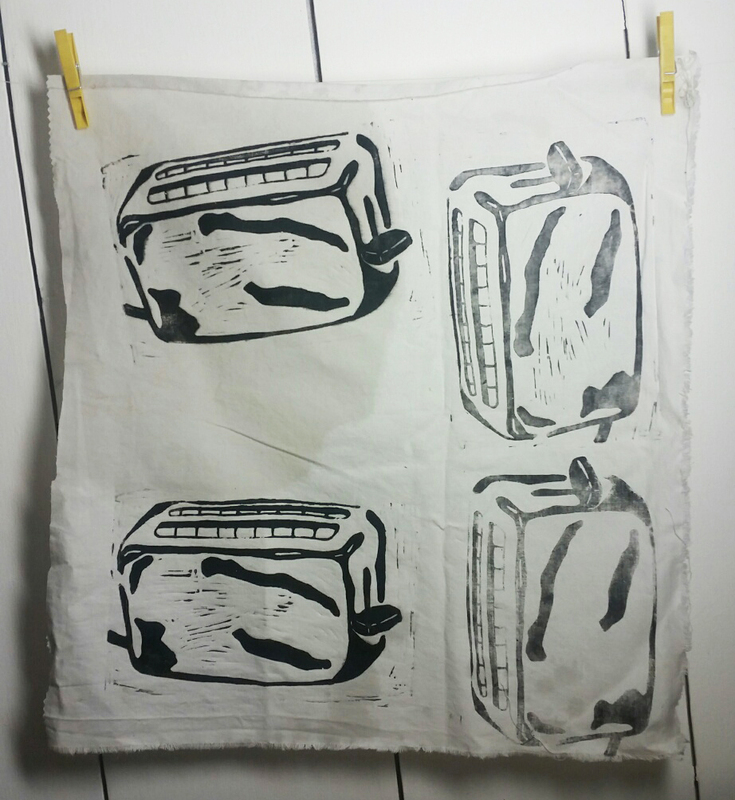 I recently made a linocut that I think would be nice on a t-shirt, and that got me thinking about finding a simple way to use my linoleum plates for printmaking on fabric. 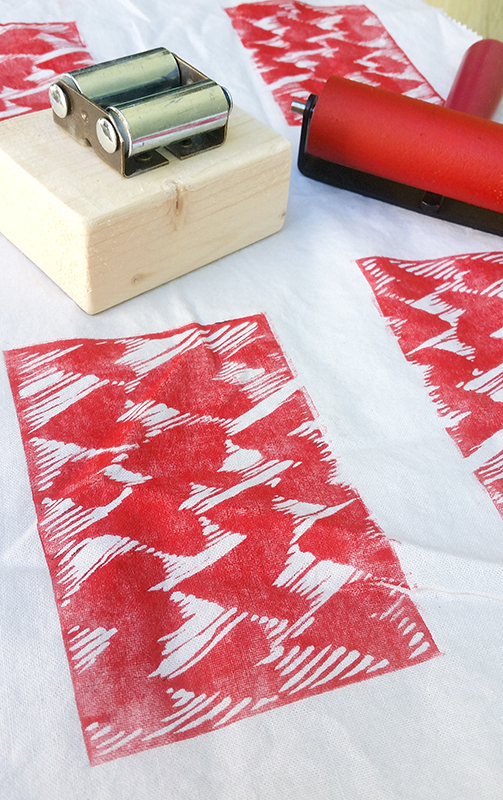 Block printing on fabric is a similar idea. 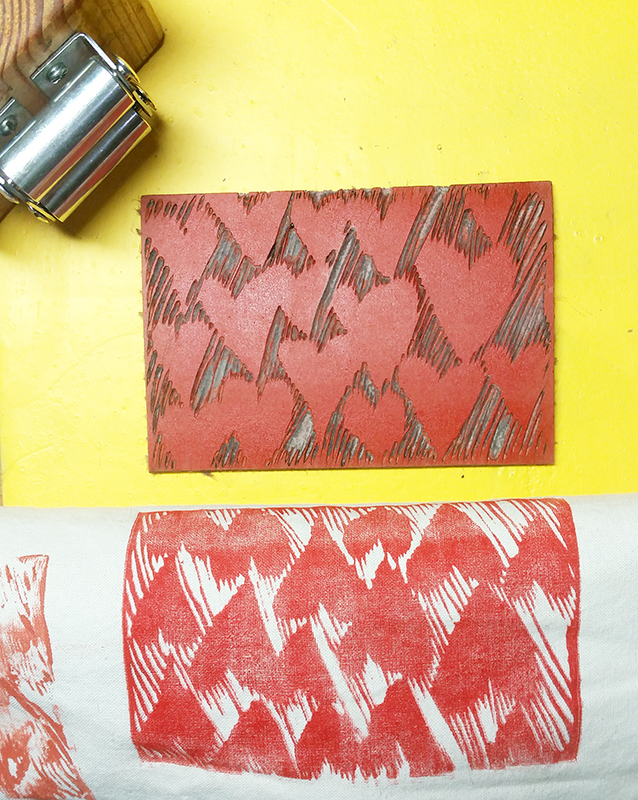 With block printing, a small stamp is used and the image is repeated. My goal is to find a way to consistently get a good transfer on any fabric when pressing a large linocut plate. 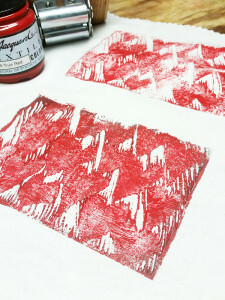 I had some Jacquard Fabric Color on hand, so I rolled that out with my brayer and applied it to my heart linocut plate. First, I tried hand stamping it (top), but that didn’t turn out very well. Using my Pocket Press and treating the fabric as paper worked pretty well. I could tell from rolling it into the plate that the consistency of the ink was the is issue here. Pressure helped, but the fabric color doesn’t have the coverage needed for relief printmaking on fabric. Next, I tried house paint. I’ve had great luck using house paint to create canvas tote and t shirt designs using monoprint plates and using DIY silkscreens. The house paint had a really cool look, but it was runny and mostly filled the gaps around the hearts. Filing this away for future experiments in intaglio fabric printing. I thought I was out of ink, but I decided to look through the ink drawer and read the packages. Akua says nothing about fabric printing. Neither do Blick or Speedball water based inks. However, Speedball Oil-based Printmaking Ink says on the tube that it is intended for use on fabric (just allow a 2 week cure time). Speedball Oil-Based ink needs a lot of pressure to transfer well. The Pocket Press was really handy here. I had to be very aware of pressing evenly with both sides of my body, and making sure I applied pressure evenly over the entire plate. If you look closely at the print below, you can see that I pressed harder with the left side of my body. Being just a little more aware remedied this problem, as does rolling over the plate a second or third time. Also, I have to press HARD. I pressed as hard as I have to when I print really deeply etched intaglio plates. The resulting fabric prints were just lovely. They have a delicate and obviously hand printed look that I will be using even if I find an ink that transfers onto fabric as well as standard inks adhere to paper. I have just ordered a tube of Speedball Fabric Block Printing Ink to see if this can create a darker print. The Speedball Fabric Block Printing Ink arrived. I tried 5 different approaches. First, I rolled out the ink normally, set the plate on top of the fabric and stood on it. I wanted to give personally applied pressure a fair shake (bottom right). Then, I rolled the ink out normally, and pressed. I got a more even transfer, but it was lighter than the silk screened look I was hoping for. So I tried wetting the fabric. This made a big difference (top left) but so did simply being more generous with ink application without wetting the fabric (bottom left). Just to make sure that more generous ink application wasn’t the only reason I was getting a better transfer, I tried applying a lot of ink and pressing with my body weight again. The results were more like the image on the top right. To get a nice, dark transfer like the toasters on the left, I found I needed to use my pocket press and to press my strength into the press using both hands. I’ll add a video below shortly. Thanks so much for experimenting with inks on fabric and sharing your knowledge with us. I want to print on fabric, got your press for Christmas, and your direction will reduce some of my learning curve. It appears you are printing on cotton.